Is your website traffic increasing but not your conversions? Does your website have all it takes to convert site visitors into customers? If you have been finding the answers to these questions, Congratulation! You are sentences away from your questions being answered. In the meantime, I want you to write down your website objectives on a piece of paper. if you don’t know your website objective, don’t worry, most of the responses we get from people are “to make sales”. Others say, “to drive leads”, “ to offer information”. Different strokes for different folks. You may write down any of these responses above. Knowing your Conversion Rate (CR) is like knowing your temperature when you are feeling ill. It won’t tell you what is wrong but will indicate to you whether you are hot or cold based on the health standard. Similarly, conversion rate lets you know whether you are hot or cold – if the situation requires action or not. Every effort you put on your website in other to make your site visitors take an action that you desire is geared towards increasing your CR, and if they eventually do take those actions, it means you have truly fulfilled their desires, thus, conversion rate is a reflection of both your efforts and the customer satisfaction. Many business owners, even though they have opt-in forms for lead generation on their website don’t really know their website’s conversion rate. Tracking your website’s CR is very important to determine if your website is performing well or not. Optimizing your site for conversion rate is something many site owners don’t take seriously, most don’t even know the term ” Conversion rate optimization (CRO). Furthermore, many site owners assume that simply driving traffic to their website is sufficient for boosting sales and generating leads. Sometime we get carried away with the endpoint ( making sales), forgetting that, every customer journeys through the different stages of the buying-decision process. Driving traffic to a website that has is not optimized for CR is like pouring water into a leaky bucket. Instead, you need to plug the holes (optimize your website for CR) in other to keep your site visitors from leaking out. Below is a simple illustration of your site’s visitors buying-decision journey through your site. Visitor lands on your website (homepage or lead page), reads the information (texts) and is compelled to take a form of action on your website ( fill out a form or click on a button) which is a measurable point in the process, but not the main goal (conversion goal). Visitor clicks on the action that has been specified on the site i.e. Link button, download button, Buy now button or fill out a form and clicked on submit. When you consider each step as an important point in the customer journey process, then you can optimize each step, test, and measure to know if you are truly converting your visitors successfully through each stage of the customer journey process. How do you influence site visitors in taking action on your website? Well, the first thing is understanding your customer behavior, which is key to successfully persuading them in performing specific actions on your site. Helping your site visitors to see what they want, when they want and in the way they want is paramount in influencing them in the buying-decision process. Your site visitors will reward you with an action that speaks louder than words (convert) if you fulfill their desires (search intent). The whole point here is establishing a good customer experience on your website that plants the seed of trust and real relationship, then nurture those seeds by giving values to your visitors. Ensure that your website is user-friendly — wireframing, storyboarding, prototyping, development is optimized. Ensure that your website loads fast — a slow loading site is indirectly linked to lower conversion rate. Ensure you are using the “trigger words” your prospective customers are using — this will convey to your site visitors that you understand their needs. Make sure that your web content is clear, concise, vivid, compelling and strictly related to your products, services or expertise. Ensure to establish trust and credibility — give your site visitors the confidence they need in purchasing from you (answer their questions). When a site visitor lands your website, he or she is looking for information relating to their search intent, if you don’t give them the information they are seeking for, they will leave your site and search for other sites who will provide them with the information they seek. For this reason, search engine companies like Google characterizes on search relevancy. 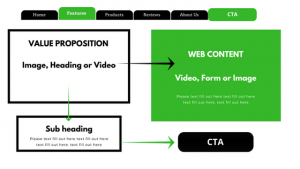 The diagram below is a conversion rate optimization example — how to optimize your website to increase your CR. Apply the “AIDAS” test (Attention, Interest, Desire, Action, and Satisfaction) at every stage in the recipe. 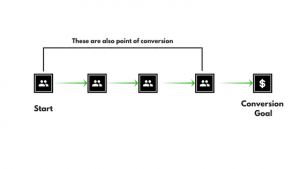 Ensure to answer the following when implementing the conversion rate recipe. Attention: Does it grab your website visitor’s attention — in about 5 seconds? Interest: Does it stimulate the interest of your site visitor’s search intent? Desire: Does it stimulate the desire to take the Call to Action (CTA) specified on your website? Satisfaction: Does CTA give them satisfaction after engaging with it? After you have successfully implemented and tested the conversion rate recipe. The next obvious thing to do is to track and measure the performance of your site to determine if your website is performing according to the expected goal — which is to convert your site visitors into customers. You need a web analytics tool such as Google Analytics or Click to track and measure website performance. These tools can also provide you with insights relating to site visitor’s behavior on your site. Entry pages and exit pages: know which web page visitors enter on and which web page they exited from. Bounce rate: To know the bounce rate will immediately give you a hint as to whether or not your CRO effort is working. Single page visit: knowing this will indicate whether or not the page is relevant to the visitors or they couldn’t find what they were seeking for. Apparently, it is important to optimize your website for CR if you want to get results (leads, sales, subscribers etc). 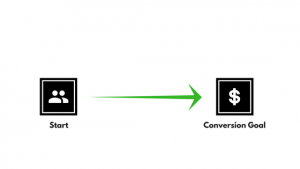 Follow the above conversion rate optimization best practices (recipe) — implement, test, track, measure and repeat the process over again to improve your online results with CRO strategy. That being said, endeavor to give your customer a KISS — “Keep It Simple, Stupid” — a popular principle of persuasion on the internet.